When it is Saturday, do you ever think about it that the next day will be the Lord’s Day? Do you ever stop and consider that it is the day before Sunday? Often, Saturdays are busy. Maybe it would be helpful to read something from the Bible, and some words in connection with it, on a Saturday night. This little book of fifty-two short topics could be used for this purpose. Why not pick it up once a week, perhaps on Saturday night, and read a piece? Read it with your family, ask your father to read it, or read it yourself before you go to sleep. Most importantly, read the Bible portion listed at the bottom of each piece, and sing the Psalters together. Of course, this book can also be read as often as you wish. Those were my thoughts when I put this little book together. What is written is just a very feeble and poor effort, full of shortcomings. It is my hope that perhaps the Lord may be pleased to bless the simple words as He alone is able to do – otherwise, it will not be worth anything. 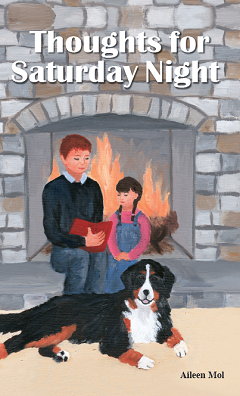 These short stories and thoughts are best suited for children ages 6 through 13.